The great mystery of why the hardwood floors are always gritty was solved when I put Mr. Nelson in the tub this weekend for his first bath. He doesn’t shed. And rumor has it that he’s hypoallergenic. Both awesome. He’s also, apparently, secretly a Swiffer. The boy had dirt hidden on him like a prisoner at Shawshank. I have a feeling this boy will love to swim when given the chance. He loved the water. 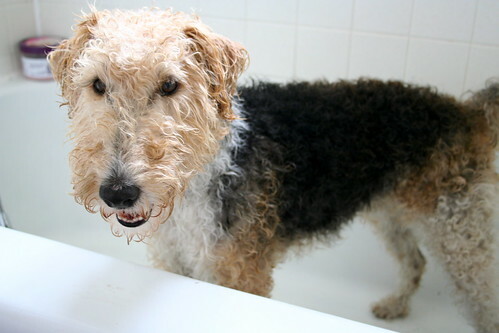 ‘Course he loves the water, he’s a terrorist, er…I mean terror….er…I mean terrier. Terrier’s LOVE to swim. Dharms is a perfect example! Even sprinklers, she’ll take any water she can get. I’m loving the way he multi-tasks with the dustmop thing going….what a find! So friendly looking! 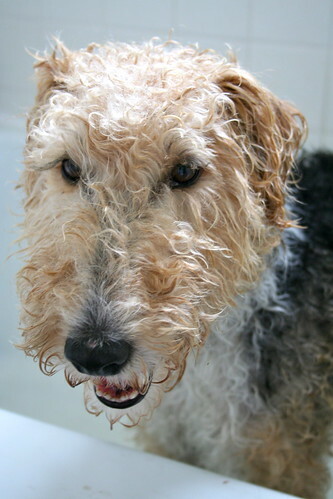 I have a soft spot for Airedales. So sweet. Glad the bath went well! He’s adorable! Nice, my dog just leaves the hair all over the floor. Gah! I can barely handle it! Is he the most good-natured dog ever? He looks like it. Eva can learn a tip or two from Nelson – she FREAKS OUT whenever she’s encountered with water. Tee hee – he is so darned cute! I love your blog even more that Mr. Nelson is featured in it!! I love his smile. And the fact that he stays in the tub without restraints.